Free Performance - Any Takers? This is a guide, not a set of rules. Feel free to change it around a bit to suit your tastes. I know I would have wanted a guide when I was first learning this stuff, just so I wouldn't forget anything, so I figured others might feel the same way. I recommend reinstalling Windows about every six months, if you have the time. It really does make a big difference. No matter how well you maintain Windows, it eventually begins to collect clutter, and only by starting fresh can you be rid of it. Make sure you test a backup before you try to use it, if you are planning to format your entire hard drive. Most mass storage media fails when you need it most, so be smart. Before you begin, I strongly suggest you back up all your data, even if you don't plan to wipe your entire drive. Hard drives inevitably fail - it is only a matter of time. With hard drive at well under $1.00 per gigabyte, a second hard drive as a backup is a very good idea. If either drive fails, you have the data, and you won't have much downtime if you have a replacement drive handy. Press delete (or sometimes F1) to get into the BIOS before it boots into Windows. Go to BIOS FEATURES SETUP or something similar, varies by board. Set CD-ROM as first boot device. Follow the steps on the Windows prompts, format the hard drive with NTFS file system. Also, you might as well go ahead and set the time - what you do now, you won't have to remember or worry about later. It will probably reboot, and if not do so manually. Again, follow the prompt to begin the installation of Windows XP. The process will probably take about 45 minutes. Assuming all goes well, reboot the machine and re-enter the BIOS. Set first boot device to Hard Drive (HDD), and restart. Windows should be ready to go. Connect to the internet, and download any operating system service packs, updates, and all drivers except for video and sound drivers (which you should get on your own), and any recommended updates that you want. For the daring, motherboard drivers are also available. Depending on what it is doing, though, you can do some real damage, so be careful if you aren't familiar with this process. If you still need video or sound drivers, download and install those. (Belarc Advisor is a little free download that can help identify your components quickly, which is helpful for finding the right driver.) For Nvidia graphics cards, Nvidia is the only source you need. For ATI cards, muahahaha! You should have bought Nvidia. ATI has issues - though you can find some graphics drivers on their site, they don't have drivers for every model. They rely on third party sites to host less common drivers. For Creative sound cards, go here. I would go through more, but there are so many different brands I could spend all day just looking up drivers. As usual, Googling is the way to go for researching unknown or difficult to find drivers. At this point, I like to get StyleXP going. Although it is cosmetic, this is the point at which I feel my computer is returning to me. I have been using themes and icon sets so long that if I have to use default Windows stuff, it feels awkward to work with. ThemeXP is the best source I have found for themes to go along with StyleXP. Of course, a pretty background isn't any help if you can't navigate your own computer properly. Open any Explorer window (not Internet Explorer). My Computer would work, but you can do this step from anywhere. Go to Tools on the menu bar, and Folder Options. Click on the View tab, and make sure these settings are checked. 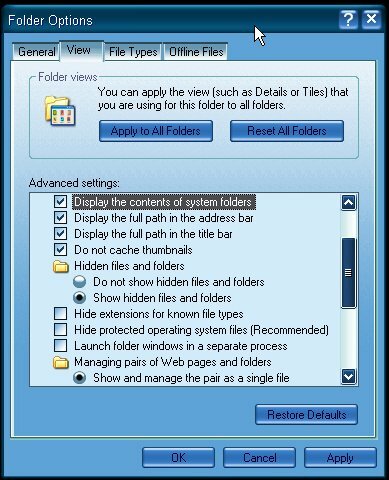 Display the Contents of System Folders, Show Hidden Files and Folders. Now, make sure Hide Extensions for Known File Types and Hide Protected Operating System Files are unchecked. To go along with these tweaks, customizing the Start Menu is now a good idea. You can also take this time to set your account options, under Control Panel - User Accounts. A password, custom pic, and so on. Though I am loath to admit it, AOL Instant Messenger is a handy program. Of course, everyone has their own preference, but I have found it to be the easiest and most versatile chat program of the ones I have tried. Using it with DeadAIM eliminates many of the problems with AIM, and you can tab chat windows so you don't have to have several windows open while talking to multiple people. While we are talking about Instant Messaging, there is another issue. MSN Messenger installs with XP, but I hate it. It puts itself on startup frequently, and interferes with other programs on occasion. If you like it, great. If not, go to Start - Run. Type (or paste, to avoid errors) Rundll32 advpack.dll, LaunchINFSection msmsgs.inf, BLC.Remove. If you get an error, don't worry about it. As long as you entered it right, MSN Messenger is gone, truly. The Google Toolbar has a very good pop-up blocker, and it allows you to search Google from any site. If you are like me, you search pretty frequently, so this is a handy tool, and saves you having to install a dedicated pop-up blocker (which you often have to pay for) when you can get the Google Toolbar for free. Now, it's time to get to work. There are two general approaches. You can optimize Windows, then install programs, or you can install everything first and then optimize. I like the latter option, because I like to do all the tweaking at once. Just for the heck of it, I'll provide a list of programs I install. Everyone's software suite is different, but you can substitute a different program of the same type easily enough. 3DMark 2001, Ad-Aware, Adobe Reader, AOL Instant Messenger, Belarc Advisor, Divx Codec, Google Toolbar, HyperSnap-DX (for taking screenshots), Media Player Classic (tiny player that supports an absurb number of filetypes), MS Office, Nero CD burning software, Ogg DirectShow Filters, PC Wizard 2004, Photoshop, Quicktime, w/ out iTunes, RealOne Player, RegClean, SpywareBlaster, StyleXP, TweakNow RegCleaner, Window Washer, and WinRaR. In addition to these core programs, of course, I add a few extras, but that is up to you. Everyone should have the original, five year old Unreal Tournament, but I don't believe my endorsement will make you all run out and buy it. If you need an excellent, very cheap game, think about it. Now that all your programs are installed, it is time to tweak. Start from the foundation. Again, it is most efficient to do everything at once, so start with basics and get more specific as you go along. That means get rid of unnecessary processes or programs that run in the background. The first and easiest part is to clear out your startup folder in the start menu. Start - All Programs - Startup. Incidentally, this location is good to remember if you want to play a trick on someone. You can place a shortcut in their startup folder that automatically restarts the computer as soon as it boots. I'm not sure if there is a way out of it, since it is a basic command line option that is run immediately upon loading Windows. Since I don't want to encourage any noble citizens reading this article, I'll do a separate segment on that. Click here for the details. And remember, I haven't tested this out - I know the shortcut works, but I don't know how easy it to reverse it, so don't get careless. Anyway, back to the topic at hand. After your startup folder is clear, click Start - Run - type "msconfig" (no quotes). Go to the startup tab. Changes to other tabs in msconfig can make Windows unbootable, so don't mess around with anything unless you know exactly what you are doing. The startup tab of msconfig, though, is unlikely to cause you much trouble. You should probably leave your anti-virus program running on startup, but I uncheck every single option other than that. Every one of the boxes checked means your boot time will be longer, your cpu usage higher, and your RAM usage higher, all things which you want to avoid if possible. Some program put themselves back on the msconfig list of auto-run programs, which is why I check this every couple weeks to make sure I don't have too many changes. The last general item is to kill all background services that you don't need. This will take you a little while - in the neighborhood of five minutes to a half hour, depending upon the number of changes you have to make. I have written pretty extensively about this elsewhere, so go to my Services Guide for info on this step. I use Quick Launch extensively, because it offers the fastest access to my main programs. Running my monitor at 1600x1200 with a double wide taskbar, I have 30 quick launch icons, and still plenty of room for up to 12 open windows. If you are cursed with a small monitor (anything less than a 19"), I wouldn't go higher than 1280x1024, but if you have a large monitor you should use the highest resolution you can get away with. It allows me to be more productive, because I don't have to spend time hunting for programs or switching windows. I put them in alphabetical order, so I always know exactly where everything is. The visible ones are reserved for programs, and the double arrow on the right expands to show all my games when I click it. I have experimented with many different schemes, and this is my favorite. Try it out, and see if you like it. Last, but certainly not least, fire up TweakUI XP, and experiment with it. It offers a ton of useful tips, so you will know what you are doing. It can be enormously helpful - make sure you spend some time finding good settings.